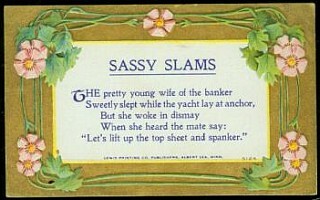 This is a rather complicated naughty nautical double entendre. But it’s not all that complicated — those terms are familiar (at least, as part of sailing jargon, if not fully understood) to anybody who’s read any nautical fiction. Later Post: Behind On Your Christmas Shopping?